Learning a new language is both exciting and challenging. It is not always easy to learn a new language but it is something that will be very rewarding. Being able to practice on a regular basis is the key. Learning a language is certainly not impossible. In fact, many people find it easier than they originally thought. If you are looking to grow as a person you might want to learn to speak Dutch quickly. Of course, learning any new language will allow you to learn more about another culture. People are usually very intrigued about learning new things and you might ask how can I learn to speak Dutch. There are so many reasons to take on this challenge. We will explore some of them and you can develop a plan to begin working on this today! Dutch is spoken by almost 23 million people as a first language. Additionally, about 5 million more people speak Dutch as their second language. You will certainly have a lot of company when you learn this new language. Think about all of the people you will be able to communicate with when you learn to speak Dutch quickly. It will be a great way to grow as a person and keep learning. Learning about the history of the language is a good place to start. The Dutch language is in the same family of the Scandinavian, English and German languages. There are many similarities among this group. The grammatical rules are considered simple compared to many languages. This will help anyone who decides to learn Dutch. Many native English speakers find learning Dutch easier than other languages. This should give you the boost of confidence you need to learn Dutch! You are probably asking how to learn to speak Dutch. We will certainly get to this soon – but lets learn some more about the language itself. It is important to note that there are different variations on the Dutch language. These are usually do to regional differences. Dutch is the national language of the Netherlands and is also spoken by many people in the Flemish area of Belgium and in several former Dutch colonies. Most people do not realize how many people speak Dutch and in how many different places it is spoken. It really is a major language and being able to speak Dutch will certainly have many advantages. The Netherlands are a major player in global trade. In Europe they are one of the main players in trade. This is one very powerful reason to learn Dutch. It will help you in business and allow you to communicate directly with an entire sector of business. When it comes to business many people look for any advantage that will help them be successful. 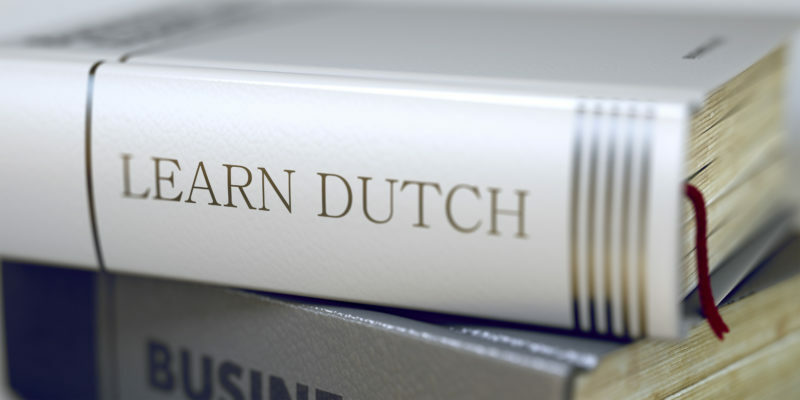 Learning Dutch will certainly help you become more successful. It will also give you a better experience if you travel to a Dutch speaking area. It will be amazing to be able to communicate with the locals in their language! You are probable asking how can I learn to speak Dutch? How can I make the best use of my time and learn this language. The good news is that there are plenty of options for learning Dutch. We will review some of the best ways to do this. Some of the old fashioned ways are still a great option. This could mean enrolling in a class taught by a native speaker or reading traditional textbooks. This method works for some people and has worked for many years. However, in today’s busy world this may not be practical for everyone who wants to learn. What are some options for people who want to learn Dutch but do not have the time to sit in a class every night or every week? What options are out there that take advantage of today’s technology? Luckily there are so many more options available to everyone now. This can be a DVD or CD based course that you can work on at your own pace in your own home. While this is a viable option it often restricts learning in the sens that the learner does not get the critical feedback that is so important when learning a new language. This option might be better than the traditional class but it still is not the best out there for everyone. With advances in technology this hurdle is being overcome. This is where the service Babbel.com shines! Babbel is an online language school with a great reputation. It has been around for a long time and many people have learned new languages using this program. In fact, it has helped millions of people learn another language. Babel uses intuitive technology that guides its students through the program and offers targeted feedback. This turns into a custom made approach to learning. Rather than just reading a book or watching a video, the program is customized to your needs based off of your progress. It will even help you pronounce words correctly using voice recognition software. It is pretty amazing! Babbel also teaches grammar. It really is a wonderful way to learn the language. One of the great things about learning a new language is learning about the culture and customs of those who speak the language. It allows you to gain an understanding of the people and places where the language is spoken. Babbel.com even delivers in this area. You can learn about Dutch traditions and customs. It really gives you an immersive experience. Using this service allows you to learn the language quickly and so much more. It really is a total experience. Imagine being able to learn a new language at your own pace and in your own home. This flexibility will allow you to decide how you learn best. It will provide you with the critical feedback needed every single step of the way. No longer are we stuck with only one or two ways to learn a new language. This opens the door to so many more people. It allows everyone the opportunity to learn. It will take some time and dedication but learning will be much quicker and much more efficient. So if you are asking how to learn to speak Dutch you should quickly check out Babbel.com!